What is the Right that I miss the most as a Lebanese Women? This is the question I as a women rights activist is always asked, and my answer is Clear: the Right to transmit my Nationality to my Children is THE Right we need to work on in Priority. 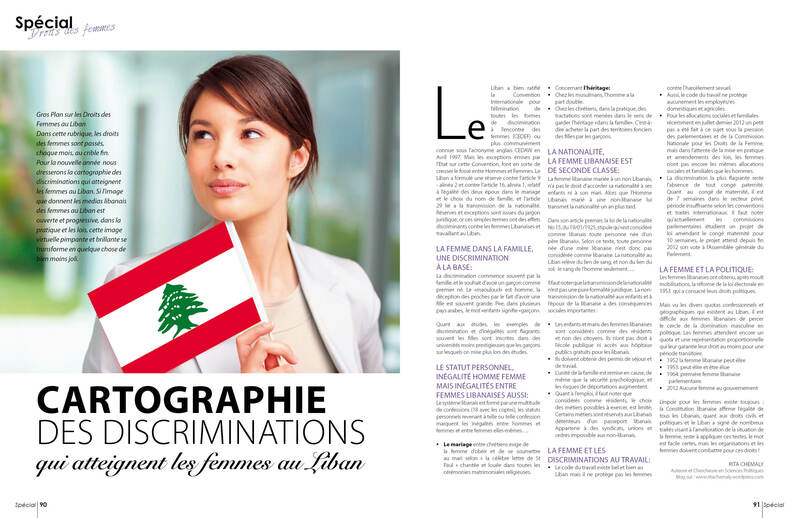 As a Women, the nationality law that dates from 1925 in Lebanon still prohibits Lebanese women married to foreigners from granting their nationality to their husband and children. Citizenship in Lebanon is based on ancestry from the FATHER /Men Side only, not where one is born. In my opinion this is a discrimination showing how Lebanon is a patriarchal society ! Today I read that Salma Hayek the Hollywood famous actress with Lebanese origins have clearly highlighted that women in Lebanon need to be able to TRANSMIT Their Nationality to their Children. True!! if as activists and lobbyist and advocates our voice is not heard by our elected Members of Parliament, maybe the voice of a Hollywood actress is more Powerful??? They can hear her voice easily??? Il faut noter que Shakira est d’origine libanaise, Salma Hayek Aussi, … mais la nationalite ne peut leur etre octroyee car elles sont des femmes, d’origine libanaise. Mika aussi est d’origine libanaise par sa mere non??? donc il n’y a pas droit non plus! On le cree ce Lobby d’Acteurs et actrices et chanteurs pour demander ce Droit Primordial pour Nous Libanais et Libanaises??? La nationalite a ceux qui sont d’origine libanaise … aux hommes pas aux femmes! je reve : je suis libanaise de 2nde classe?